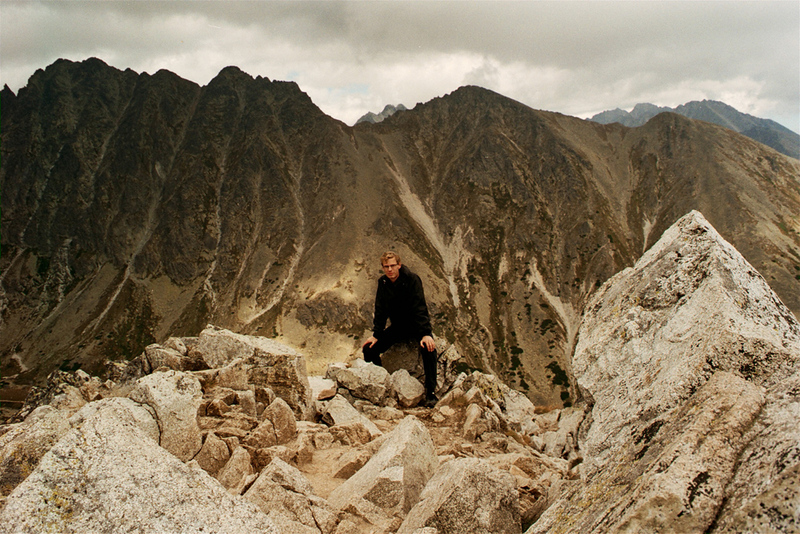 We took the car to the Slovak High Tatras and hiked for three days. This first photo is the view from our hotel room. The trip was totally improvised, so we didn’t dare to buy new shoes (in case they would hurt before we got used to them) or any other expensive equipment. Maybe we had luck or maybe three days is the upper limit for hiking in sneakers, jeans and one single backpack. Anyway, the whole tour was awesome. 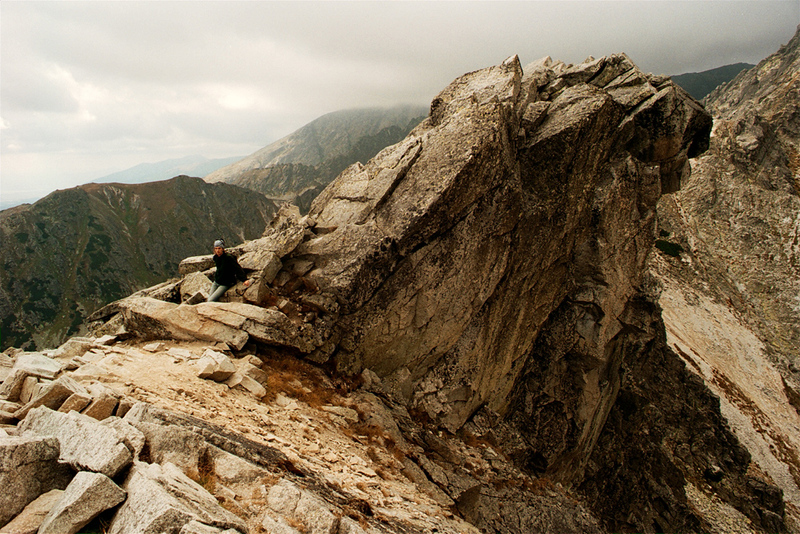 On the third day we climbed Kriváň, the 2494 meter high mountain that is Slovakia’s national symbol. Here are the photos, the maps and some words about each day. Enjoy! 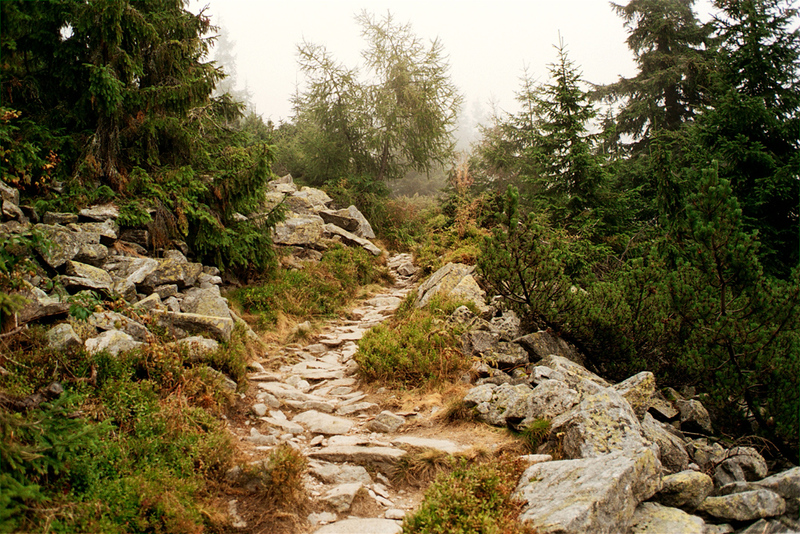 The trail was well-used after half a century of hiking. 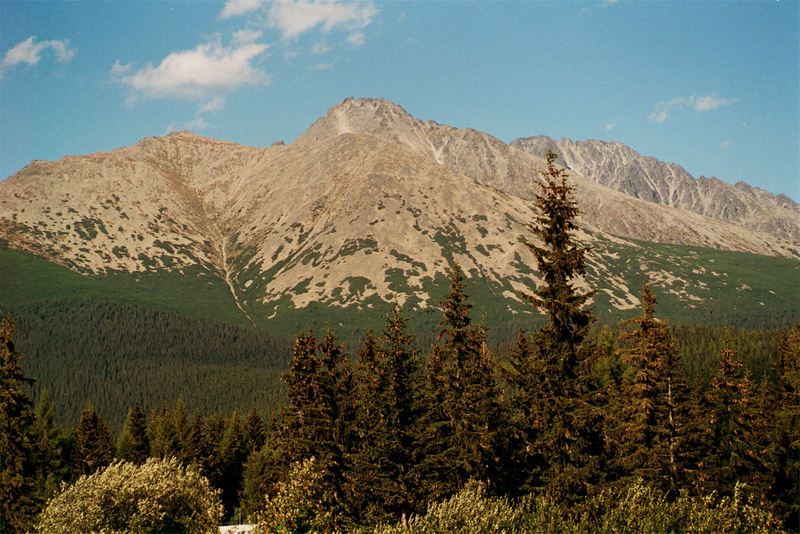 This has been a national park since 1949, and it is forbidden to diverge off the beaten track. Since this was the first hour of our first mountain hike ever, we were still somewhat nervous – would we make it in our sneakers and without reliable equipment? At least, we had brought food and 3 liters of water in the single backpack. Halfway up the valley we passed the waterfall Skok. Look at the photo and realize how small the people are compared to the waterfall. 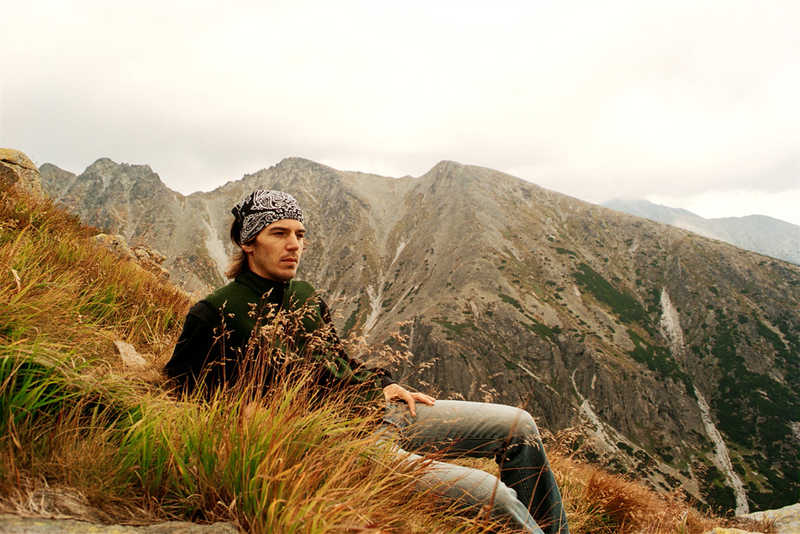 We took a rest here before we continued to Pleso nad Skokom (The lake over Skok) at 1801 meters above the sea level. At the lake Capie pleso, we took a rest again to prepare for the high climbing to the Bystre pass. There were many people here, who spoke Slovak, Polish, Czech and Hungarian. We heard only a few people speaking English and German during the whole holiday. Even Russian was more frequent. After an hour of climbing rocks like stairs, we finally reached the Bystre pass. Chains and wires helped the many people to climb over the mountain ridge at 2314 meters above sea level. The photo is taken from the other side, where people have just done their heaviest climbing and are starting to hike down the western valley, Furkotská dolina. This is the view from the pass. As you can see, the weather wasn’t the best. But on the other hand – I think that’s what it’s always like this high up in the sky. It was extremely windy and cold here, maybe 8 degrees centigrade. At the mountain lake further down, we took our next rest and had some Tatranky, a Czech chocolate bar. 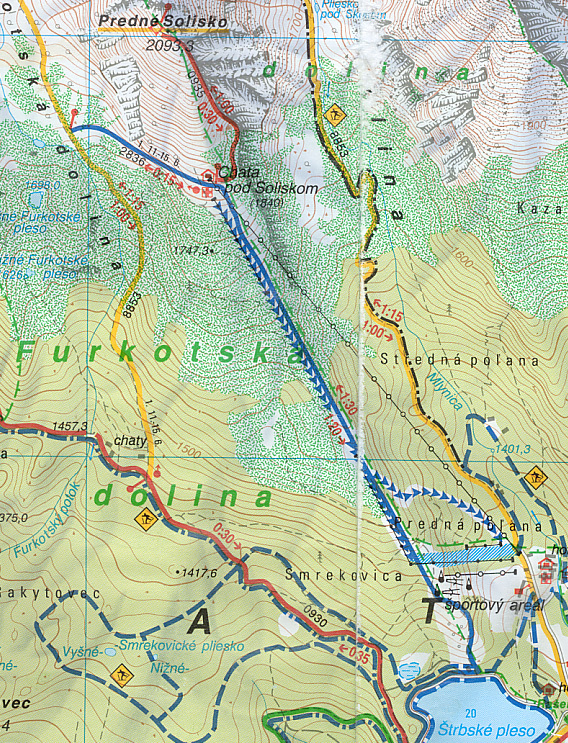 This is the western valley, Furkotská dolina, that would take us back to Štrbské Pleso. Note that the background is not just a sky, it’s a landscape half hidden in clouds. We were still 2000 meters above the sea level as I took this photo, but the tree limit is getting closer. 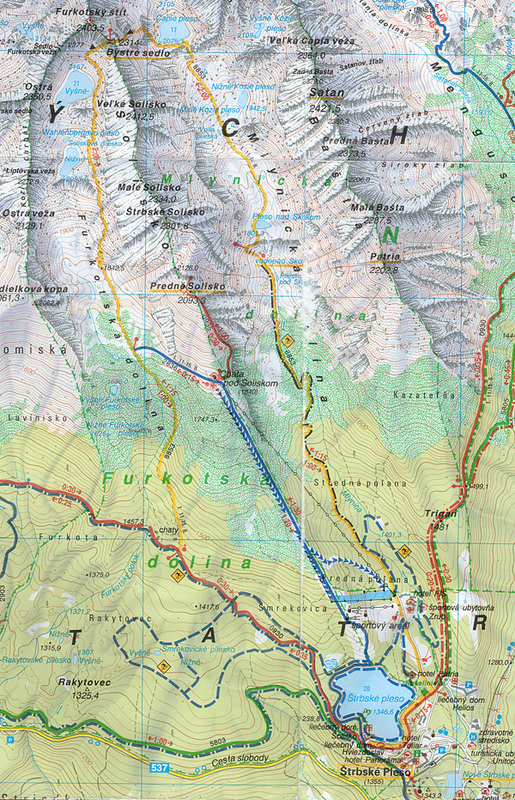 Walking down the Furkotská valley was a piece of cake and very nice. We were so satisfied that we had climbed a pass (the first in our lives), so it was like as if we were flying down the beautiful valley. It took 6,5 hours to do this hike, which is pretty normal (the guide stated it would take 6-8 hours). We certainly didn’t have the right equipment – our sneakers made us take wrong steps sometimes, which could have led to injuries. 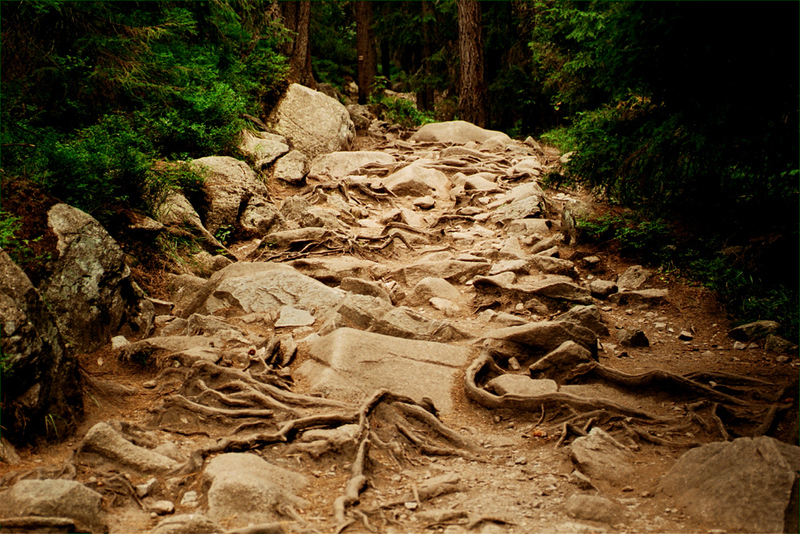 But it worked, and we were happy that it’s possible to improvise a mountain hike like this. This photo is taken (automatically, I placed the camera on a stone) in the Furkotská valley some hour before the yellow trail merged with the red Tatranská magistrála, which is like the superhighway trail of the Tatra mountains. Despite the overall cloudy weather, there is some sun shining at as on this photo, which pretty much reflects our mood. The next day we would climb the mountains that you can see in the background of this photo. 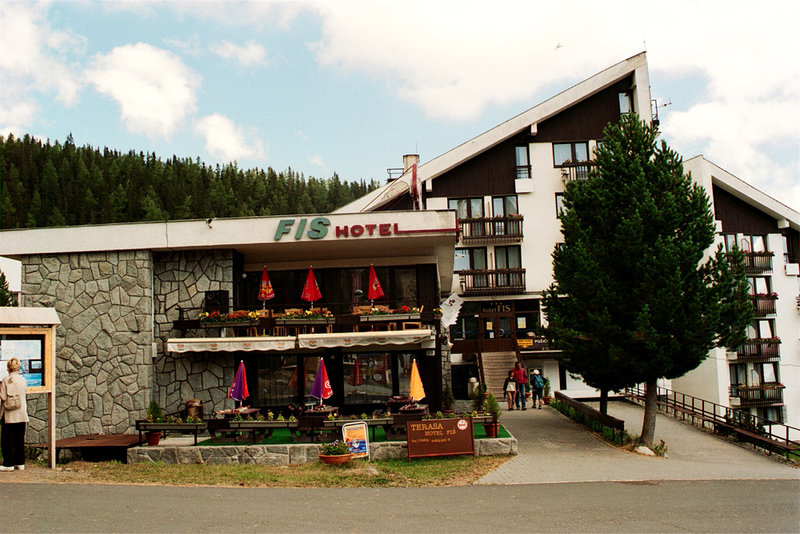 But as we reached Štrbské Pleso again, we couldn’t think about that. We could only think about one thing: FOOD!!! And so head for the first restaurant we saw to have a huge meal with a lot of proteins to build up our worked out bodies. This day, we first took the car to Tatranská Lomnica, where we wanted to take the funicular to a high peak. However, they had some technical problems that prevented us from going all the way to the top (we only made it halfway), so we decided to go back to Štrbské Pleso and do some shorter hike instead. From the lake Štrbské Pleso (at the down right on the map) we took the lift up to Chata pod Soliskom (Cottage under the Solisko) – that is the blue, straight trail. 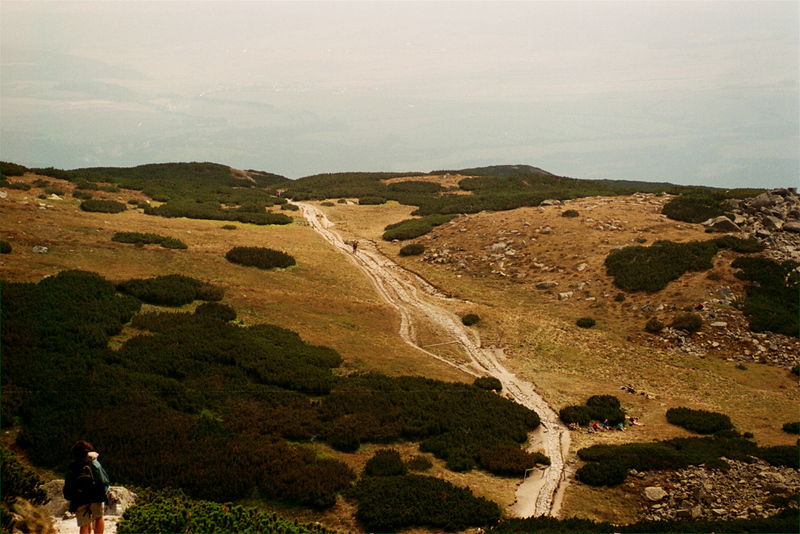 From there, the red trail climbs the peak Predné Solisko, 2093 meters above the sea level. 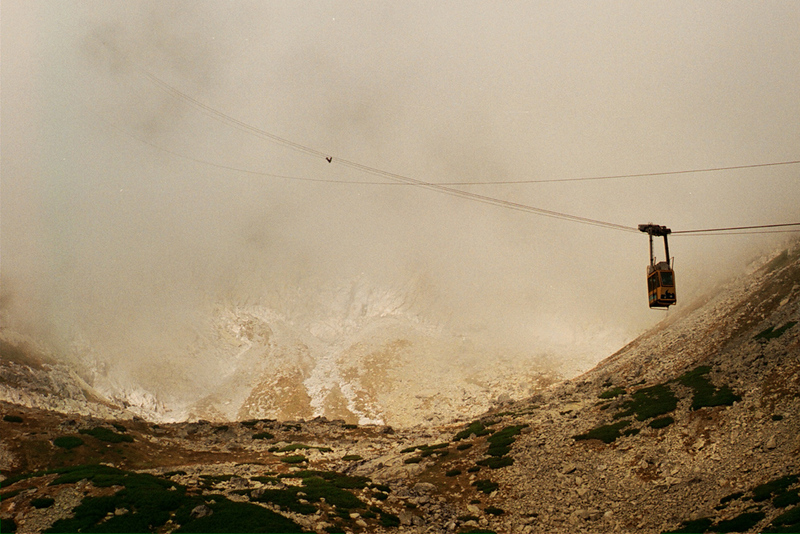 This is what it looked like when the lift had taken us up to the Solisko cottage. 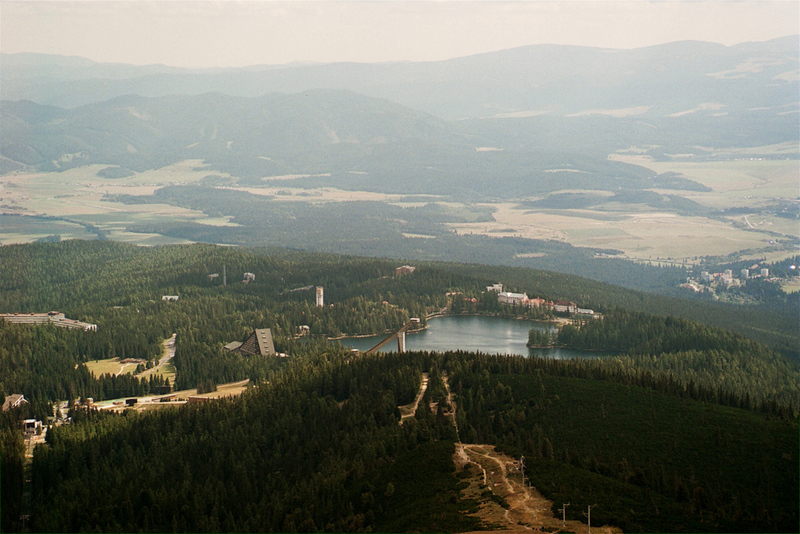 The lake you can see is the Štrbské Pleso. And now we’re already at the top! The hike took actually only two hours in total (up and down), so I don’t have any photos from the walking. In this photo, I would have fallen down and died, had I taken a few more steps backwards. Look at the really cool stone formation on this photo. The background is to the west, hence the Furkotská valley. It was very cool that we could see the yellow trail of yesterday – on our east and west side – from this peak. The red trail stopped here, but we continued to walk on the mountain ridge for a while. You could see in the ground that others had done so before us. 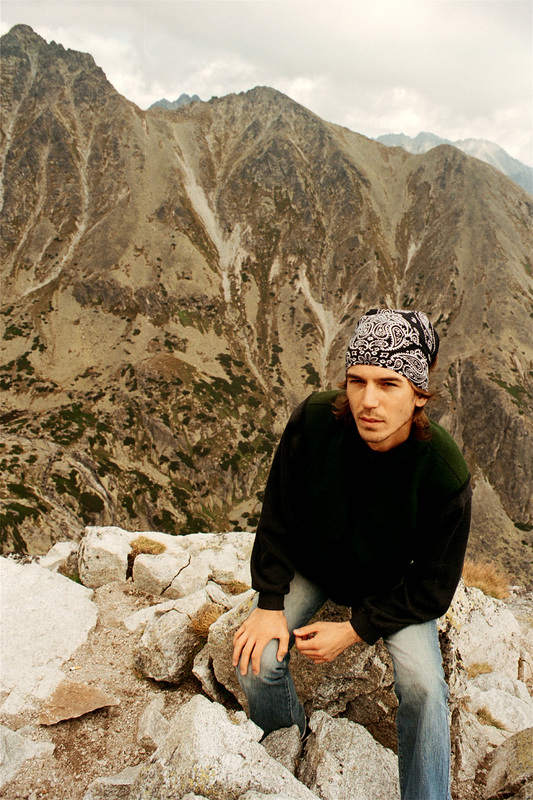 What a feeling to stand on a mountain ridge, where you can fall down in two directions. On the photo, the west valley of Furkotská is to the left, while the east valley of Mlynická is to the right. And here is what we saw from the mountain ridge: the western valley Furkotská dolina, where we had hiked the day before. Now we stood on the mountain that was in the background on the last photo of yesterday’s travelogue. How beautiful wouldn’t it have been with a blue sky and some sunshine too? Now it was all cloudy and in the distance we could hear a thunderstorm getting closer. That made us turn around and start our hiking back to the lift. We were surprised to meet some people still on their way up. After all, a thunderstorm was getting closer. We stopped halfway down to have a rest with water, bananas and Tatranky (Czech chocolate bars). 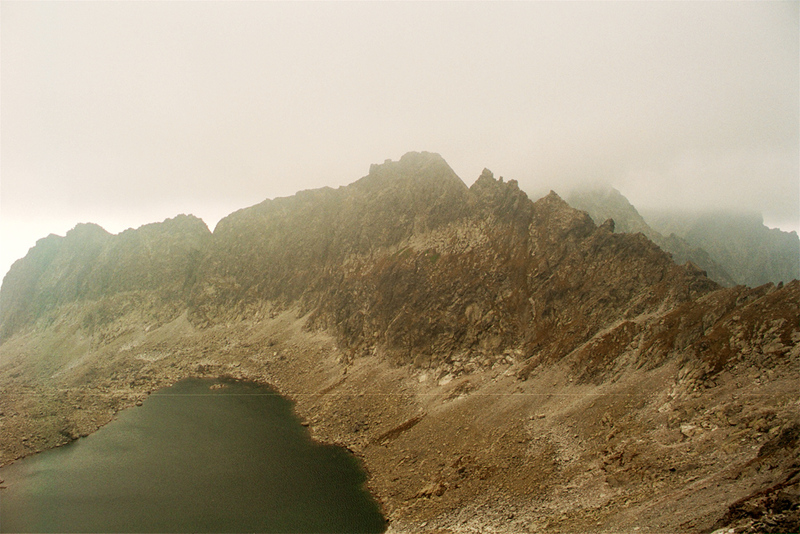 As we reached Štrbské Pleso, the rain started to pour. It was nice to be back inside the cosy hotel as the thunderstorm raged outside. We started out at the parking lot down left at the map (a blue P). 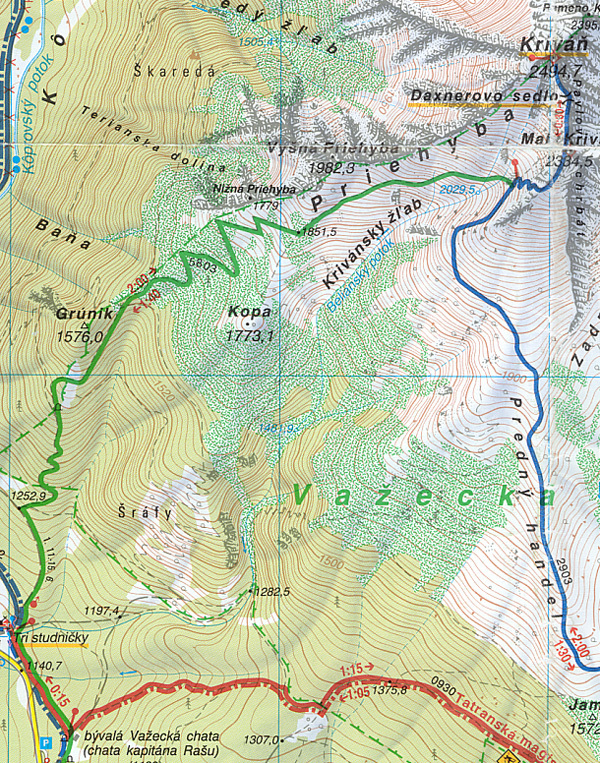 From there we walked the green trail upwards, until it merged with the blue trail that comes from the east (from Štrbské Pleso). 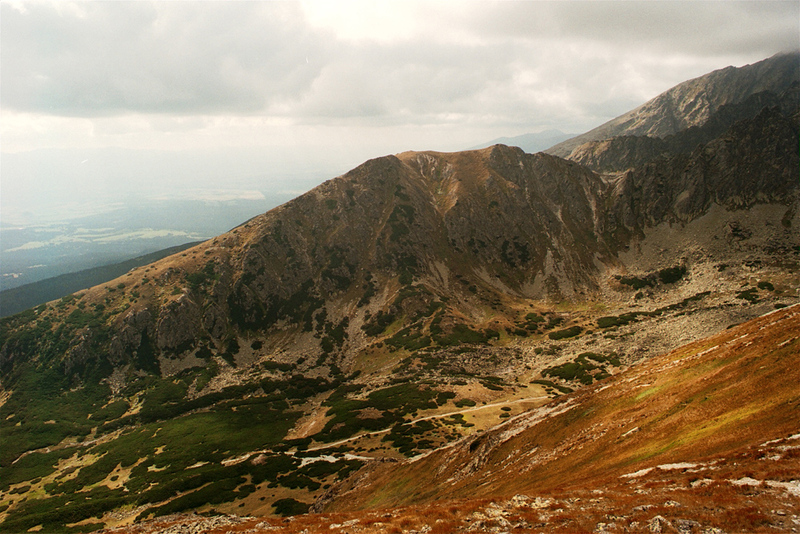 From that junction we – and many others – started to climb to peak of Kriváň, 2494 meters above the sea and Slovakia’s national symbol! 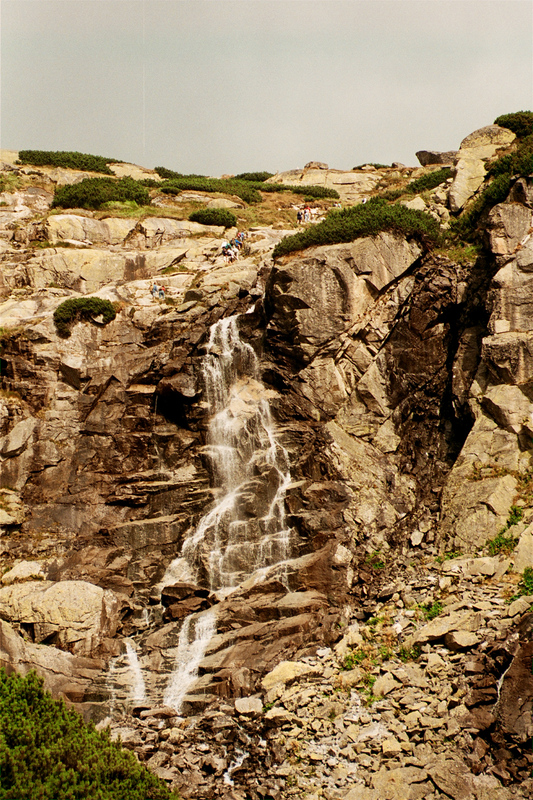 The nature is extremely beautiful in the High Tatras. Despite quite many people hike here, there is surprisingly little rubbish along the paths. 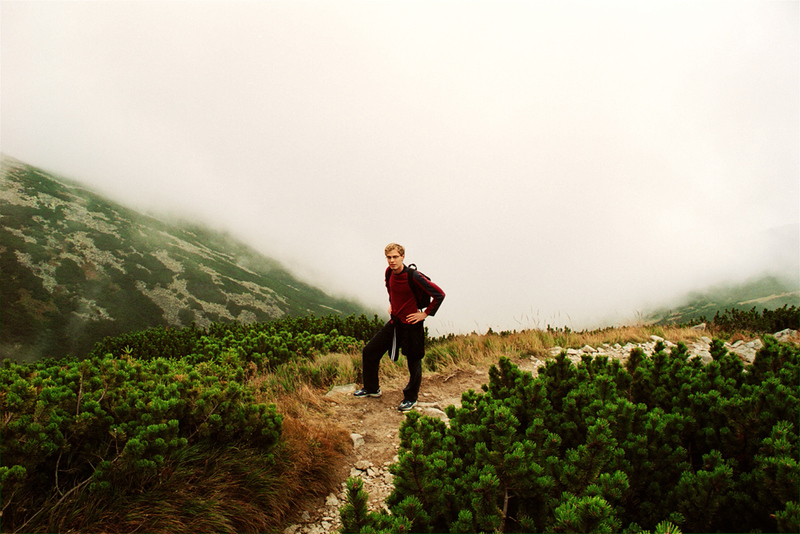 It was a cloudy day – partly because we were hiking into the clouds. At this part though, we hadn’t even reached the tree limit. On this photo, I’m at the tree limit (marked by dwarf pine trees). 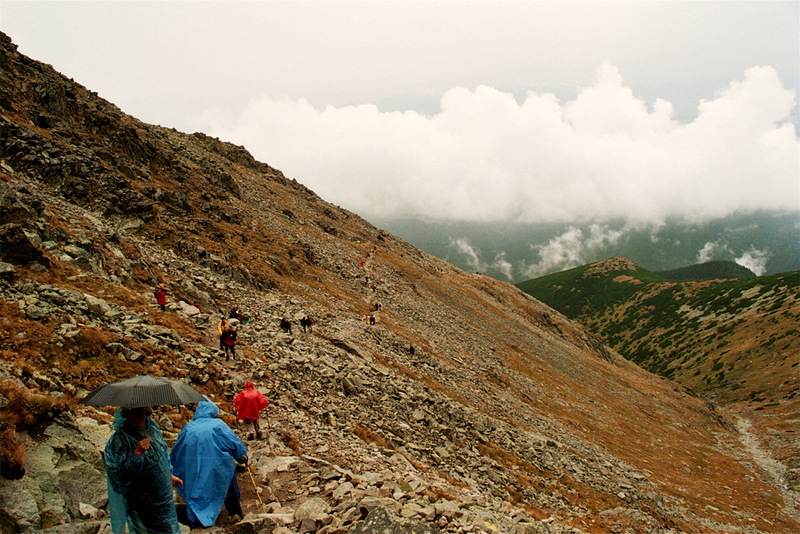 At this point, the first rain started to fall, but we didn’t want to turn around, halfway to the peak as we were. It was raining more or less heavily as we reached the junction where the green trail (the one we came from) joins the blue. 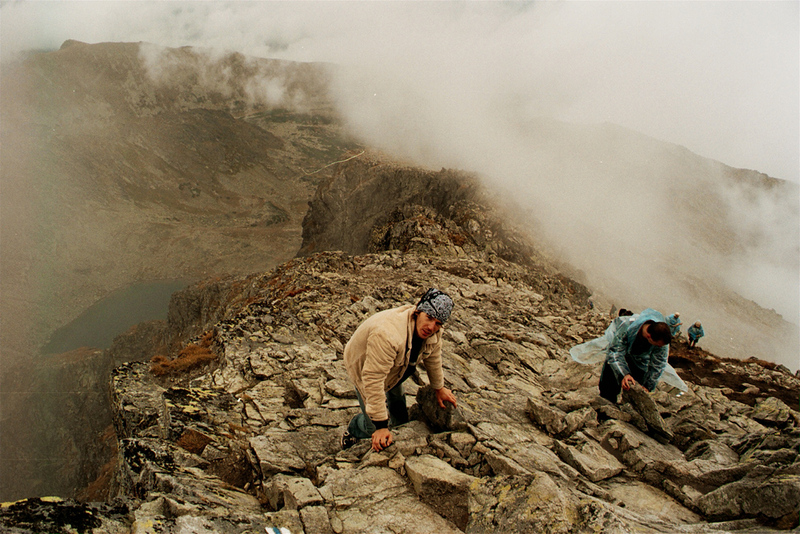 On the photo, you see the blue trail that goes back to Štrbské Pleso. 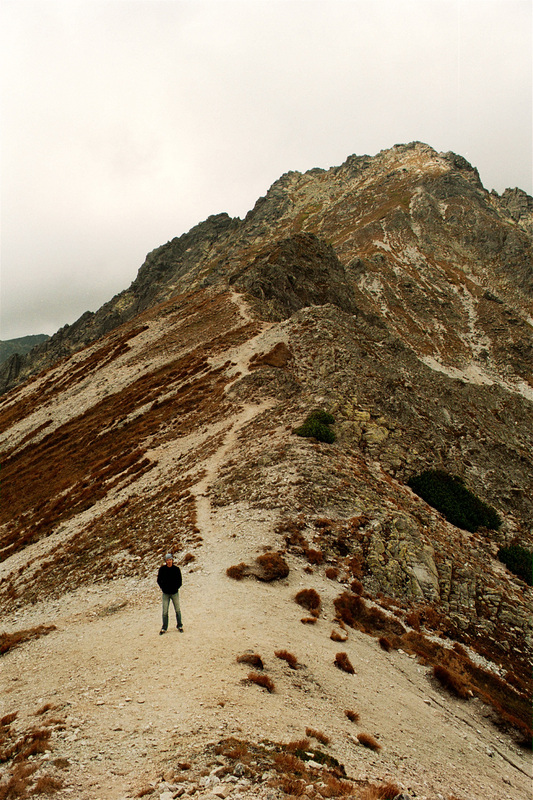 We would follow it in the other direction – up to the peak! We stopped for about half an hour at the junction to have lunch. I ate canned mackerels which gave me the strength I needed, because we were both quite pissed at this point, due to the weather. 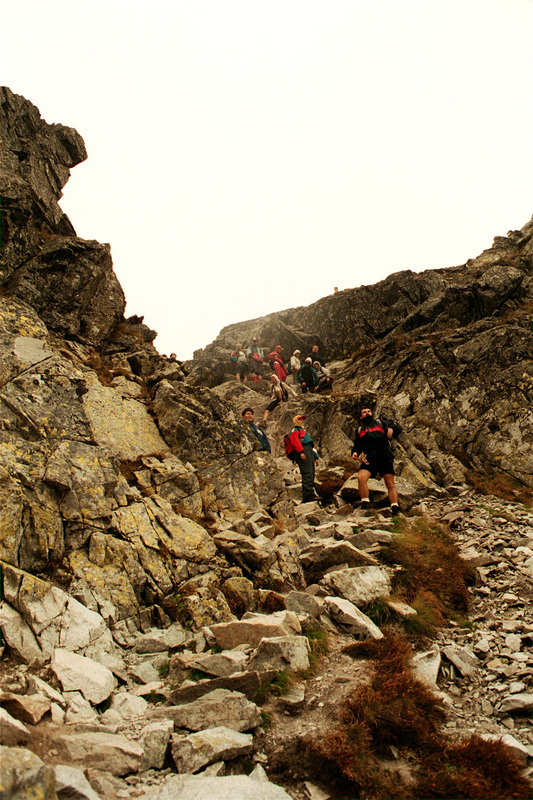 Climbing the last meters up to the peak at 2494 meters above sea level. As you can see, we were climbing on the ridge, on slippery rocks due to the rain. It wasn’t raining all the time on the way up though. The view from Kriváň was astonishing, despite we could only imagine how beautiful it would be in sunny weather. 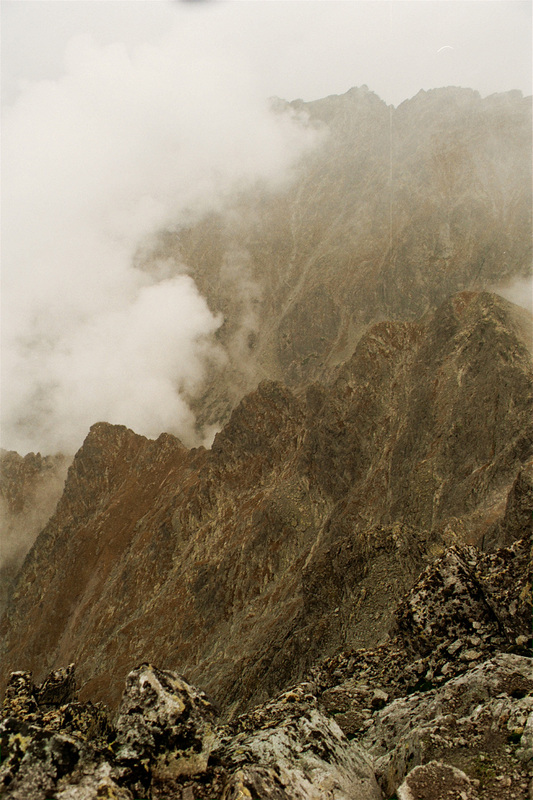 I took this photo from the top, just seconds before we were surrounded by clouds and hardly could see even 10 meters in front of us. As we started to climb down, it started snowing. The snow quickly transformed to rain, and we had to take extraordinary care not to slip while climbing down in our sneakers. The whole hike took 8 hours. When we came back to the car, we hit the road immediately to go back to our flat in Budapest. Before we reached the Hungarian border, we had a huge meal – Slovakian food has never tasted so good.